There are places in the world that just conjure up iconic images. Dubai is certainly one of them. The skyscrapers rise out of the sand right on the beaches of the Persian Gulf. It’s as if 100+ story buildings are sitting right on the beach. 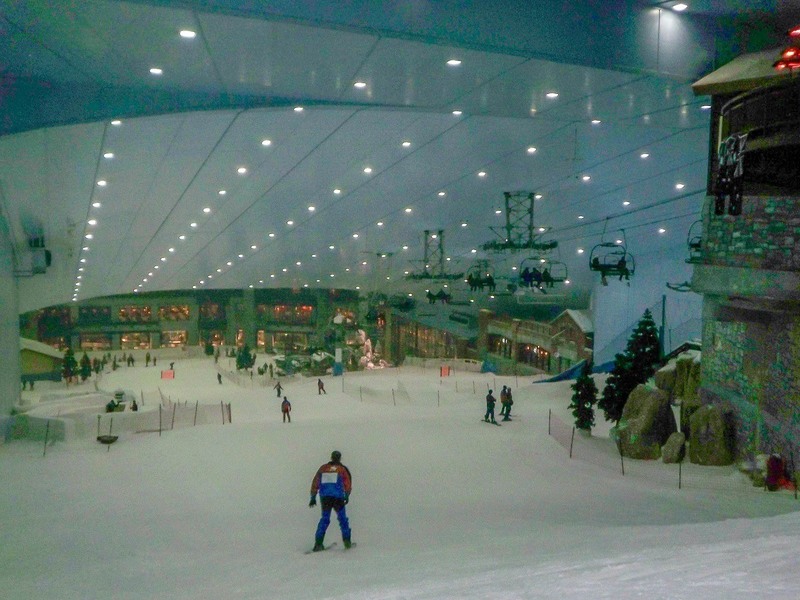 But as I think of Dubai, I had another image in mind: a group of Arab men with traditional head coverings skiing in Dubai at an indoor ski park. I don’t know where I first saw this photo. However, I knew I had to go to Ski Dubai to experience this for myself. I grew at the foot of the Rocky Mountains in Colorado. Skiing was a passionate past time for my family. My grandfather used to go backcountry skiing at places like Winter Park long before they were actually ski resorts. On the other hand, Laura had only been once growing up. But one of our very first vacations together as a couple was skiing in upstate New York. But skiing in Dubai? We had to try this! Ski Dubai is a legend. 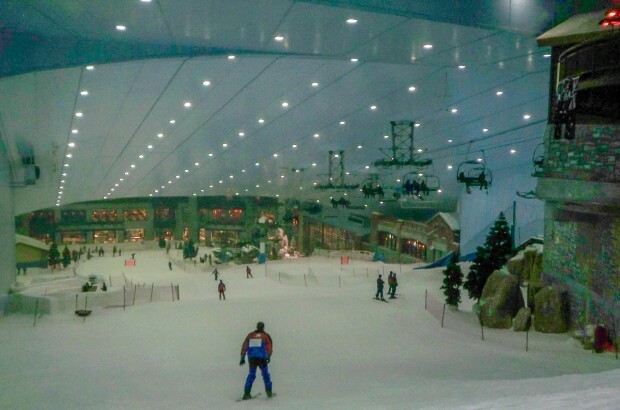 This indoor ski park in the Mall of the Emirates has been featured on all the travel shows and magazines. Whatever you might imagine skiing in Dubai to be like, we promise you that it’s better! The Ski Dubai experience is built for convenience. It’s right inside the Mall of the Emirates, one of the world’s largest shopping malls, where you’ll find plenty of stores and restaurants nearby. Ski Dubai provides nearly everything you would need: lift ticket, ski or snowboard rental, and even warm outer clothes (and helmets are provided for children). The only thing not included in the price is a hat and gloves to keep warm (this is for hygiene reasons). You can buy hats and gloves from ski shop or the H&M store right outside. 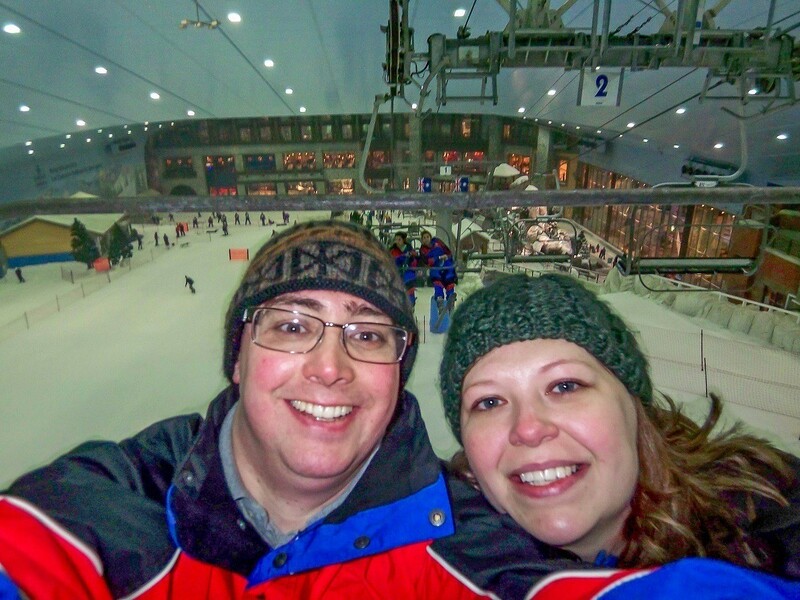 The Ski Dubai park offers a couple of different experiences. At its core, it’s an indoor ski slope with five different runs that offers a several hundred foot vertical drop, including the world’s first indoor black diamond run. You purchase your lift ticket for 2 hours and can then add additional hours. But Ski Dubai also has tube slides, jumps, a toboggan run and an interactive feature with live King Penguins (we’ve never seen penguins at a ski resort, but this is Dubai!). Ski Dubai is fascinating. The snow quality is quite good. Since the sun doesn’t shine on it, it doesn’t get icy. The run is a little short for our taste (at around 400 meters), but it is cool to think you are doing this in the desert. 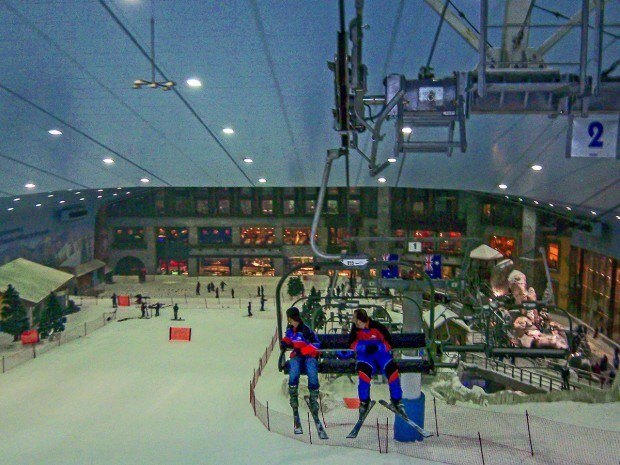 Inside Ski Dubai, it’s a year-round temperature of 30 °F (-1 °C). Skiing in Dubai is an almost surreal experience. You can experience winter’s chill on real snow knowing that it is blazing hot outside. Ski Dubai was amazing! Ski Dubai is open daily. Sunday-Wednesday from 10:00am-11:00pm; Thursday from 10:00am-midnight; Friday from 9:00am-midnight and Saturday from 9:00am-11:00pm. There can be occasional schedule disturbances, so consult the website to sure opening times. 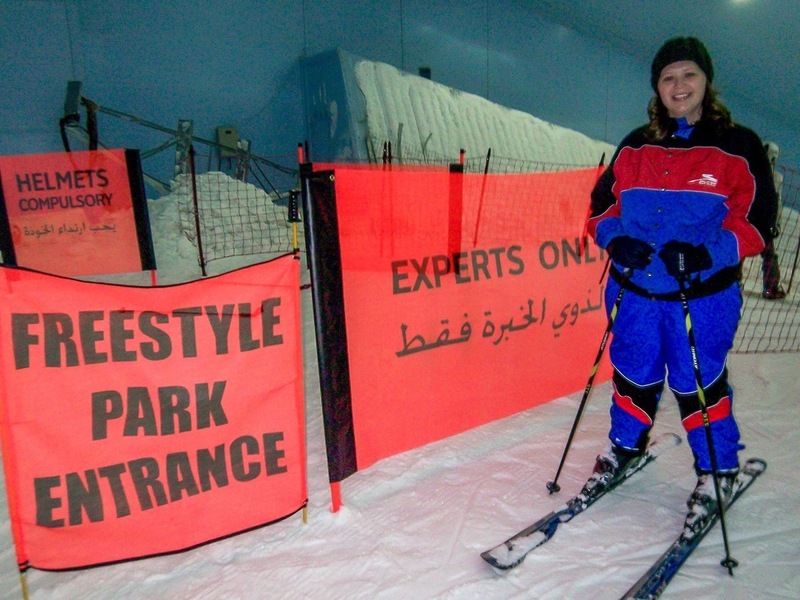 A two-hour ski slope pass for experienced skiers is AED 255 for adults and AED 255 for children. A full-day ski slope pass (all day with multiple entries) is available. Other packages with lessons are available. Ski Dubai is located inside the Mall of the Emirates. If you don’t want to buy a hat and gloves at the Mall of the Emirates, you can bring your own. We would also recommend you take a pair of heavy, calf-level socks (such as hiking socks). We both had low-cut socks and the ski boots rubbed raw places on our calves. A couple of happy skiers!